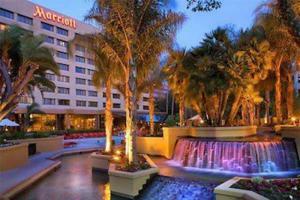 Experience West Coast warmth at the Long Beach Marriott. This resort-like hotel satisfies a variety of interests with its location near top attractions, major sports teams and splendid beaches. The indoor-outdoor event space provides a perfect backdrop for weddings, meetings or social affairs. The hotel offers shuttle service to Long Beach airport for your convenience. Modern accommodations, amenities and décor add to its appeal. Signature Marriott Revive® bedding, concierge level access, deluxe granite countertops, and upgraded bath amenities set the stage for a comfortable stay. 22 miles from Los Angeles International Airport, 22 miles from John Wayne Airport, .50 miles from Long Beach Airport.